Hanoi (VNA) - Vietnam’s business climate is anticipated to improve in the second half of 2017, but economic growth will be at 6.5 percent, falling short of the Government’s target. According to the forecast of the National Centre for Socio-Economic Information and Forecast under the Ministry of Planning and Investment, economic growth in the remaining months will be fuelled by the improving global economy, investment climate, prospects of international integration and upbeat mood of businesses. The second half of 2017 will witness significant impact from the Government’s reform policies and efforts implemented in 2016, which will support businesses and boost investment higher than last year. The centre said economic growth will be positive when the three major drivers - agriculture, industry and services - all saw improvement. The services sector witnessed two-year high growth in the first seven months of this year, while the industry and construction sector is anticipated to continue recovery strongly, particularly the manufacturing and processing industry, along with a steady agricultural sector. Foreign direct investment (FDI) inflow is also anticipated to benefit from the improving investment climate coupled with the country’s intensive international integration as well as confidence of investors in the Vietnamese economy. The centre estimated disbursed FDI would total 15.3 billion USD in 2017. “The increasing FDI inflow is expected to be a major driver for recovery of export growth in the entire 2017,” the report stated. 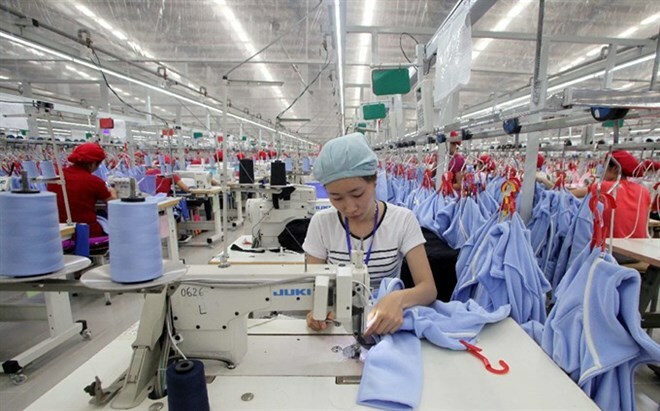 However, the Vietnamese economy was facing a number of difficulties, especially following the US withdrawal from the Trans-Pacific Partnership (TPP) agreement and trade protection policies. In addition, uncertainty in global oil prices, which had fallen to below 50 USD per barrel, added to the risks. “If oil prices continue to decline, Vietnam needs to consider increasing oil exploitation output to meet the growth target,” the report said. Oil prices would significantly affect inflation in the second half of this year, but prices of goods were forecast to remain stable despite a slight increase in wages from the beginning of July. The centre forecast inflation would be controlled at below five percent this year, specifically at four percent. GDP growth would be some 6.5 percent, lower than the Government’s target of 6.7 percent. Many organisations recently forecast lower-than-target GDP growth for Vietnam in 2017. HSBC recently lowered its GDP forecast for Vietnam to six percent this year, down from its previous forecast of 6.4 percent. The International Monetary Fund forecast Vietnamese economic growth at 6.3 percent, down from an estimate of 6.5 percent published in May. The World Bank (WB) projected the Vietnamese economy to grow at 6.3 percent this year.